Film making is a complicated and time consuming process. I am amazed at the number of professionals it takes to put together a single movie. When it comes to the logistics of creating a film, the director more than anyone else is responsible. I'm not talking about writing, or art work, or acting, or photography, or any of a dozen other specialties. I mean the work of putting those all into motion, shepherding them through the process, and making sure that all the I's are dotted and the T's are crossed. There are a hundred decisions a day and a movie means thousands of decisions. That is one of the reasons that directors since the 1960's, are not likely to have a lot of movies out in a single year. When putting together a film in the Golden Age, the studios were factories that used assembly line type processes so a director could go from movie to movie as a hired hand. Since the end of the studio era, directors and producers have to be more than just technicians, they need to be entrepreneurs, and showmen, and hard nosed financial negotiators. Steven Spielberg, has had five years in his career in which he has put out two movies in a single calendar year. These week we get two Spielberg films within three days of each other. The last time I remember a film maker having two movie out that close to each other was in 1983 when John Badham had "War Games" and "Blue Thunder" in theaters at the same time. It happens a lot with actors, but it is rare for producers and directors. Yesterday on Christmas we saw "War Horse". Less than sixteen hours later we were sitting down to enjoy "The Adventures of Tintin". These two films have very little in common when it comes to story, theme or style, yet they are both very much Spielberg films. "Tintin" is an action based adventure story along the lines of Indiana Jones. This is the Saturday serial form that Spielberg grew up loving and that he brought to life with the Indy series. This new film however is based on preexisting material and I think that puts a little bit of a straightjacket on Spielberg's usual story telling skills. It is a great Adventure story, but it lacks some of the touches that we are used to from Mr. Spielberg. Those weaknesses are a result of the source. 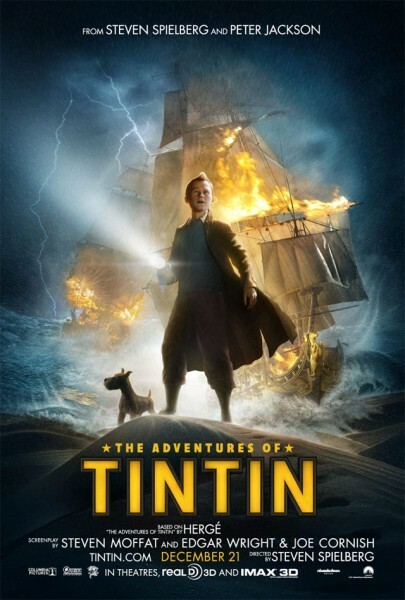 Tintin is a comic book serial. I first encountered the character in Boy's Life magazine back in the sixties and seventies. We would get a story serialized over a few pages and then have to wait for the next month's issue. Dramatic development is skimpy as a consequence and the focus has to be on action. This movie is a motion capture animation movie. This allows incredibly complex action pieces to be visualized that could never really exist in the real world. It looks great but often lacks the tension that comes from identifying with a character at risk. This is a little strange because there are a lot of animated movies that achieve this objective. This story may lack some of these qualities because it is treated as a continuing series, we are not given anything about the lead character to care about or feel a connection to. Harrison Ford could make Indiana Jones come alive just by turning and facing the audience in his first revel. Tintin is introduced through a character drawing of an animated face, and it is a scene that has no tension to it. After that, he is simply a character we follow, without ever becoming the hero we invest in. On the other hand, his dog "Snowy" does achieve some degree of emotional life that will later make what happens work better. There is quite a bit of humor in the film, most of it in the form of slap stick visual gags. these usually involve the other main character in the story, Captain Haddock. He is the comic side-kick but also the protagonist in much of the story. These seem like complicated roles to be playing simultaneously. I liked several of his lines of humorous dialogue and some of the visual tricks, but I don't think he can carry the story on his back and that shows where the weakness of Tintin comes in. He has no distinct characteristics except his hair. That is not enough to build a two hour movie around. Because this is the first of a proposed movie Trilogy, we may get more in the later stories, but for the moment, the archetype of the intrepid young reporter simply feels empty. The look of the movie is one of it's strong points. The images match the look of the comic as I vaguely remember it and it has a very early twentieth century movie vibe. I especially liked the title sequence which was very reminiscent of Spielberg's "Catch Me If You Can" opening titles. The John Williams score is also very effective and it feels more jazzy than orchestral in nature which does work for the movie. It's not that I'm disappointed in the movie, it is simply that I wanted it to be more emotionally involving. It stimulates and entertains but I never felt connected to it the way I have with most Spielberg pictures.